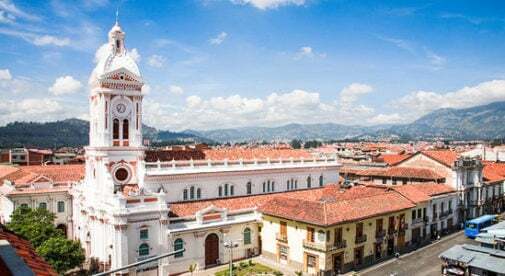 What’s brave about retiring at age 55 to one of the world’s top retirement destinations—Cuenca, Ecuador—with spring-like temperatures all year long (lows in the 50’s and high 70’s) and not having to work unless I absolutely want to (I’m a freelance writer). I enjoy going to the thermal baths and spas in Baños, just 20 minutes away from our condo, twice a week…eating out with friends in trendy restaurants three times a week…“splurging” on a dozen roses (just $2 a bunch) every week, and occasionally attending a free concert alfresco under the lights of Santo Domingo Iglesia. Our life in Cuenca is so rich and full, I sometimes feel guilty—not brave. I’m tempted to tell everyone to stop calling me courageous because I actually feel extremely fortunate. Family and friends back in the States just don’t get it because they’re too busy trying to survive. Our peers are still working full-time jobs, losing their health insurance benefits and 401ks, and wondering how they’re going to pay the mortgage next month or replace the brakes on the car that they’re still making payments on. Six years ago, we were in the same situation when my husband was given the choice of retiring at 55 or work five more years with one of the world’s largest transportation companies for an extra $200 a month in pension. If we had stayed in the States that would have been brave, but instead we stepped out of the box into a world of possibilities and have never looked back. 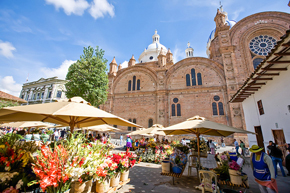 Connie and her husband Mark have traded their lives in for a new one in Cuenca, Ecuador where they enjoy the low costs and spring-like weather. We traded a life of drudgery for a life in the land of “eternal” springtime, high in the Andes mountains. We don’t need a car in Cuenca, which is our greatest luxury. Instead we take taxis ($2 a trip), the bus (25 cents), or enjoy leisurely strolls or bike rides along the Yanuncay River with its Eucalyptus tree-lined banks. Best of all, we have no more medical bills. We belong to the Ecuadorian social security system for $81 a month, which includes office visits, labs, hospitalization, and medication free of charge (no co-pays). And we’re able to enjoy vacations twice a year on Ecuador’s magnificent coastline and trips back to the States to see our kids, who remind us of how we once struggled to make ends meet. Sure we had to learn a new language and adapt to doing things a different way, but that’s all part of the adventure.